1 How does your product/service work? We install a set of sensors around the wind farm tower, connected to a computer located inside the tower. The device is equipped with an antenna and informs the user of all collisions with precise timing of the event and location of the victim. The service provided may be limited to the actual counting of the collision victims, but may be extended to indicate the species performed by the field team. 2 Why your species monitoring costs are low? The price of monitoring is so low because our employee visit the field only when the collision is detected and does not have to perform a heavy and time-consuming "blind" search and search efficiency is usually extremely low. B-finder locates the victim's fall to the ground, what significantly reduces the working time of the field-team. 3 Do you like future-telling? We do not estimate, we do not calculate probabilities, we do not foresee the future. Divination does not fit into science. B-finder is a device / service / standard for measuring the phenomenon. 4 Who is your customer? Wind turbine operators and owners, environmental protection administration. 5 Do you have contracts? B-finder is a technological innovation presented to the wind industry at the Hamburg Expo in 2016 and currently is developed with the support of the the Polish Agency for Enterprise Development and the National Research and Development Center. The 12 month test will be finished in 2018 and the device will be market ready in 1Q 2019. 6 Why is your team the team to bring this to market? B-finder is developed on the basis of 12 years experience of EMPEKO S.A., a wildlife research company that has conducted over 1200 cumulative months of bats & birds monitoring for wind projects. The teen-person team consists of biologists and engineers. 7 Why do you develop B-finder? All wind turbine owners today are forced to use primitive monitoring methods by zoologists searching for the victims under the wind turbine. B-finder standard let the wind industry from the primitive methods used up to now and allows, automatic, transparent self-monitoring. As environmentalists dealing with environmental impact assessment of wind turbines we have been many times frustrated unable to answer our customers' questions about the mortality of birds / bats on a given project. Nobody knows what will happen, how many animals will be affected. One day, I was called by Lukasz, a project manager for a wind project developer who urgently asked me to calculate the likelihood of bird and bat collisions, for the due diligence of the bank financing the project. Environmental advisors are paid for their knowledge, so it is difficult to say "I do not know” to their regular client at the very crucial moment deciding whether to be or not to be a project. But it was such a difficult moment and according to my best knowledge I couldn’t say otherwise. The next day B-finder project was born in my head. 8 Who are your competitors? Companies performing post-surveillance monitoring with primitive methods of searching victims under power plants. There is no direct competition for offshore locations. 9 Do you have a patent? B-finder is patented and patent pending. What’s more, we received a grant from the Polish Agency for Enterprise Development for a patent protection on target markets around the world. 10 Do you have partnerships? B-finder is an independent project with benefits for the wind power industry, environmental administration, renewable energy consumers and flying animals. Development of high-tech device causes informal partnerships with component suppliers. 11 What is benefit for wind power industry? Automation of measurement makes the monitoring transarent. Accurate measurement says true, instead of kind of divination . This frees the turbine owners from the fear that the project due to the interpretation of biologists will be considered harmful to birds / bats on the basis of low quality input. Lastly, the interaction between the wind turbine and animals can be measured with the same measure, and the turbine owner will know directly what the result is, without third parties interpretations. 12 Why is your product/service better than what’s already on the market? The table below compares B-finder and existing solutions. B-finder is 3 in 1: a measurement standard, device and service. 13 What about benefits for environmental regulators? Automation of measurement makes the monitoring transparent. Accurate measurement says true, instead of kind of divination . This frees the regulators from the fear that the project due to the interpretation of biologists will be considered harmful to birds / bats on the basis of low quality input. Lastly, the interaction between the wind turbine and animals can be measured with the same measure, and the regulator will know directly what the result is, without third parties interpretations. What’s more, B-finder is today the only device for fatality monitoring on offshore projects. 14 What is benefit for energy consumers? Energy buyers can assess the environmental footprint and projects located in wrong places with high negative impact on flying animals will be distinguishable from projects with low impact. The measurement standard makes such a comparison reliable. 15 Your solution bring detailed information about the impact. Isn’t that awkward knowledge? Acceptance of low quality of traditional monitoring methods is the result of lack of alternatives. B-finder opens a new chapter in post-construction monitoring. Unprecedented change is automation of the process what results in greater independence of the industry from the biologists; Measurement standard means no fear of unfair treatment of market participants; On-line access make the data acquisition and processing transparent. 16 What, if the monitoring results will show very high impact? We believe, high quality data input is the best ground for decision making. Wind power industry knows mitigation methods to avoid high negative impact. With B-finder such means can be tailored with profits for energy production and bat & bird protection. 17 Everyone says they can monetize the data they collect. What’s your plan? B-finder user defines who and how often the system sends alerts and/or reports. Monitoring is ordered by the environmental regulator, so environmental protection agencies will be probably the first in the list of user-defined destinations. B-finder is a great tool for corporate social responsibility. The results may be important for energy buyers, and the standard of their acquisition will increase the attractiveness of environmental-friendly locations. 18 B-Finder is universal tool. How do you see the future of monitoring based on it? However some kind of mitigation can be necessary for projects with extremely high impact, we propose a model in which we do not interrupt the electricity production. Thanks to the accurate and standardized measurement, we can count the impact of turbines on animals. For example the U.S. fish & wildlife agencies collects fees from environmental users for each shot deer, caught perch or eagle fallen as a result of a collision with wind farm. Such a system guarantees the return of funds allocated to restoring the animals population by the nature protection services. Such financing allows feeding deer in winter, restocking the perch, building nesting for eagles. The compensation proportional to the number of victims/year and depends on species spent on compensatory measures will offset the impact, and the continuous productivity of the wind turbines will be a compensation for wind turbine owners. 19 Can you explain your pricing model? B-finder prices are tailored to the specification of the project. The price depends on the period for which the contract will be signed and the number of wind mills. The subscription includes automatic collision monitoring. Additional species identification can be delivered as needed. 20 What about investors structure in your company? B-finder is developed by EMPEKO S.A., family business and the owner of company, Michał holds majority stake. We are going to build relations with new investors in all main markets around the world, so the investors structure will change. 21 Do I have stop my wind turbine? B-finder assembly / disassembly takes 1-2 days and requires access to the wind turbine. Any service events that require shutdown of the plant are short, and their schedule can be matched with other service plans for the plant. 22 Victim searching is necessary because the counting of victims alone does not give information on the number of collisions of rare species whose loss is more important than common species. Yes, data on collisions of rare species are important for assessing the impact of wind power on their populations. For such needs we provide additional victim identification services that is cheaper than the traditional methods of monitoring, because we have the results from the device. At the same time, the result itself as a number of individuals / time is a comparable, universal and simplest indicator of the impact on environment. That’s why even today the number of victim/year is common in scientific papers. 23 The mortality of animals may depend on the various environmental factors associated with the location of the wind farm concerned. Do you take this into account in your action? B-finder database can be great source of information in this area of research, but this is not main goal of our activity. 24 Our environmental decision requires bats and birds monitoring with species recognitions. Does your device recognize species? B-finder monitoring allows species recognition, but the device itself does not identify the species. For onshore projects requiring accurate data on species composition, we offer extra service of victims finding, identification and documentation. With B-finder you spend much less time for ground searching, because you know the location of carcass. 25 You are from Poland, a country with high coal consumption and your project is financed by government agencies. What is the hidden purpose of your activity? There is no hidden purpose of our activity. EMPEKO in first 10 years of activity in Polish environmental consultancy market became one of the 5 top companies in wildlife research. Our strong position in Poland is the result of cooperation with many companies in wind power industry from different countries. Our roots are in Polish wind power industry, one of the 15 biggest in the world. Governmental grants for patent protection and prototype integration and testing demonstrates the technological attractiveness of our product, the promising business model and are a confirmation of the focusing on innovation by the Polish government. B-finder is a global innovation and is perceived by us in the prism of the markets in which our customers operate. 26 There are radars locating birds from a distance and ultrasonic detectors that stopping turbines in the event of high bat activity. Are these systems competitive for B-finder? B-finder is a collision-counting system and the competition for it are traditional methods of monitoring mortality, such as searching for victims by humans or humans with dogs. Systems that locate birds or measure bat activity around a turbine and thereby stopped wind turbines are aimed at preventing collisions and as such are not competing for B-finder because they play a different role. Besides stopping the rotor requires a lot of time. Detected animals can die before the blades can stop. On the other hand, bats and birds can bypass the turbine. Such systems may therefore be ineffective and cause unnecessary losses of the electricity production. The choice of the means belongs to wind turbine owner. 27 Our organization evaluates mitigation devices. Can we use B-finder with another systems? Yes. B-finder can be great source of information about efficiency of mitigation technologies. 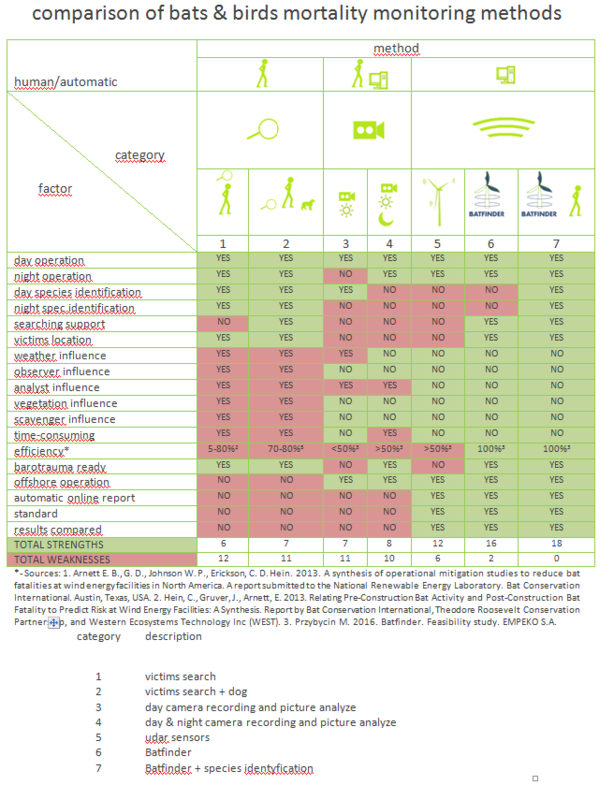 28 Are there any cross validated information about effectiveness in detecting collidated bats and birds? During the 17-month long test of the B-finder prototype in real conditions on wind turbine we have performed more than 800 simulations and gathered real collisions of bats and birds. 29 Cats kill millions birds every year. Why should I buy system like B-finder to count animals killed by wind power if at the same time nobody care about birds killed by cats? Environmental impact assessment procedures are dedicated to industries. The wildlife mortality monitoring is part of environmental monitoring focused on impact making by wind power. Man can control technology to know the impact and reduce it, so environmental impact assessment is kind of control of our technologies. The control of animals like cats is more difficult, although some solutions like bell on the cat’s neck are dedicated to decrease the effectiveness of predator. The number of birds killed by cats shows us how huge pressure affects populations. On the other hand, cats eat mainly small, common species of birds, so they don't affect populations of rare species (more about this issue you can read here). We believe, that we should control the impact as possible. B-finder is technical solution at the beginning of reducing our impact. 30 If you compare the impact of cats and windmills on populations, you must know that cats don’t kill birds of prey. Isn’t it? Yes, the impact on birds of prey is the challenge. Their populations are rather small, they reproduction is slowly and they don’t afraid the wind rotor. Here you can read more. 31 What is the difference between B-finder and Batfinder? There is no difference. "Batfinder" is just previous name of the system, but today we call it "B-finder". 32 Why do you use 3 levels of sensors instead of 2 or 1? Our patent pendings include solutions with one or more levels of sensors although the vertical field of view in sensors make the 1-level system useless: the dead animal fly isn't distinguished from alive. If you have 2-levels you can tell the difference between collision and alive animal fly. 3-levels of sensors additionally eliminate false signals.